Warm your home and dry your shoes. Photo credit: Dan Phiffer. It’s time to give your fiery passions a voice. No, not those fiery passions, we’re talking wood stoves here! You can help shape the future of wood stove design by voting for your favorite high-efficiency, next-generation wood stove in a contest sponsored by the Alliance for Green Heat and Popular Mechanics magazine. Mark Knaebe, a natural resources and bioenergy expert with FPL, is one of the judges for this unique competition. 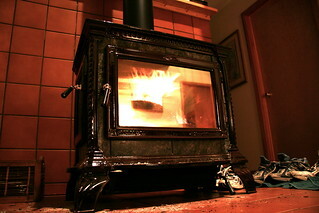 Many wood stoves and boilers are not very efficient, says Knaebe. Some may burn well but then push much of the heat up the chimney. Others may include precipitators to capture fine particulate matter but still emit carbon monoxide, a poisonous gas. “And those are the good ones,” says Knaebe. The final phase of the contest will be a Wood Stove Decathalon on the National Mall in Washington, D.C. held this November. This entry was posted in Bioenergy & Biofuels and tagged bioenergy, firewood by James T. Spartz. Bookmark the permalink.